This news is sure to give you chills, where a Taiwanese woman who went to a hospital recently with a swollen eye found four live bees living inside her eye and feeding on her tears. This story seems to be from a science fiction movie, but this incident actually happened in real life, where a woman in Taiwan went to a hospital recently with a swollen eye. At the renowned Fooyin University Hospital, doctors found four live bees living inside her eye and feeding on her tears. According to the Guardian, the doctors have managed to extract all the four bees from her eye socket. Speaking to media, the hospital's head of ophthalmology Dr Hung Chi-ting said, "I saw something that looked like insect legs, so I pulled them out under a microscope slowly, and one at a time without damaging their bodies." "Good that she had not rubbed her eyes as it could have squashed and killed the bees, and this would likely have led to more serious injury and could have caused blindness," doctor added. Further media reports states that the bees entered her eye while she was pulling out weeds from near a relative's grave. She felt something go into her eye, but assumed it was just dirt and washed it out. The next day, she found her eye swollen and went to the hospital. உயிருக்கு போராடிய தந்தை.. மகனும் மகனின் காதலியும் நள்ளிரவில் எடுத்த முடிவு! ‘மாத்திரைக்கு பதில் ஒரு மாத்திரை அட்டையையே விழுங்கிய பெண்மணி’.. அதிர்ச்சி சம்பவம்! ‘என்னா எனர்ஜி’.. சிசேரியன வெச்சிக்கிட்டு டாக்டருடன் டான்ஸ் போடும் கர்ப்பிணி பெண்.. வைரல் வீடியோ! This page contains news relating to various facts and events. The views are generally about current affiars and general topics in diversified areas such as political, international, national, and regional issues, sports, health, travel, lifestyle, technology and business. People having similar interets on the above topics will find this page useful. 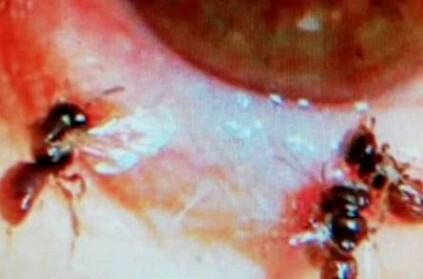 Doctors found four bees living inside woman's eye, drinking her tears | World News.